In his first visit as Chinese head of state to Vietnam, President Xi Jinping met Thursday with General Secretary of the Communist Party of Vietnam (CPV) Central Committee Nguyen Phu Trong in Hanoi, where Xi called for proper management and control of the maritime disputes. The visit is expected to cement the Sino-Vietnamese bilateral relationship, which this year marks the 65th anniversary of establishing diplomatic ties. After being welcomed by a 21-gun salute, Xi met the general secretary, who described the visit - the first by a Chinese president in 10 years - as having "a very significant meaning," AFP reported. Xi, who also held talks with Vietnamese Prime Minister Nguyen Tan Dung on Thursday, said on his arrival in Hanoi that "I hope my visit could help cement our traditional friendship, outline future development of our relations, and lift the China-Vietnam comprehensive strategic cooperative partnership to a new level," the Xinhua News Agency reported. Nguyen Phu Trong last visited China in April and Vietnamese President Truong Tan Sang attended the ceremony to celebrate the 70th anniversary of the Chinese People's War of Resistance against Japanese Aggression and the World Anti-Fascist War in September in Beijing. Analysts said Xi's visit to Vietnam can be seen as a milestone as it demonstrates that both sides are willing to seek common ground despite their differences, while the meeting with the Vietnamese government is expected to bring fruitful outcomes and may reach further consensus on handling South China Sea disputes. 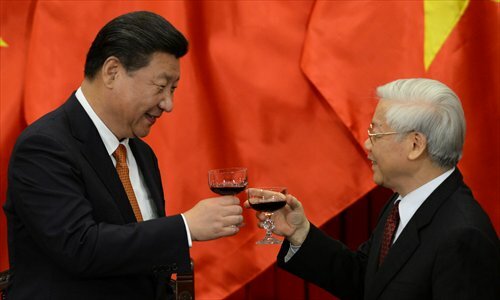 "Xi's Vietnam visit shows both sides attach great importance to the relationship and it is believed that political confidence will be nurtured," Su Ge, president of the China Institute of International Studies, told the Global Times. Ruan Zongze, vice president of the China Institute of International Studies, told the Global Times that the demarcation of the Beibu Gulf proved that it is possible to solve territorial problems through dialogue. "China and Vietnam have the experience to handle territorial disputes in order to create a win-win situation through negotiations," he said. "Territorial disputes have always been a bilateral issue and can only be solved between the states concerned. Other countries that are not involved in the area should not intervene as it will only complicate the situation," he said. Gu Xiaosong, an expert on Southeast Asian studies at the Guangxi Academy of Social Sciences, told the Global Times that finding a resolution for the maritime disputes may take a long time, as the South China Sea disputes involve more countries in the area and even outsiders such as the US. "The situation is relatively more complicated than the Beibu Gulf." China has been Vietnam's largest trading partner for 11 consecutive years, while Vietnam is now the second-biggest Association of South East Asian Nations (ASEAN) trading partner of China. The two countries have also witnessed enhanced people-to-people exchanges in recent years. After concluding his Vietnam trip, Xi will also make a state visit to Singapore from Friday to Saturday at the invitation of Singaporean President Tony Tan Keng Yam. Xi is also scheduled to meet Taiwan leader Ma Ying-jeou on Saturday in Singapore to exchange views on cross-Straits relations. Ruan said Xi's Singapore visit will benefit the stable, peaceful development of the region particularly with Singapore acting as the coordinating state in the region. Gu also agreed and said the visit will further deepen Sino-Singaporean ties and said it is likely that China could learn modern management techniques from Singapore, which is a mature, successful regional economy.